After reading the article, I'm somewhat getting the gist that the Archbishop was referencing that Aliens were demons, or at least Orthodoxy Abductions by Aliens had some kind of demonic affect. I'm not sure whether or not to give him credence on the article, or think "what the heck is an Archbishop doing writing about this". The tales of abductions--ie, being taken inside of an alleged alien craft and being gang-raped by little green men, seem to be clearly demonic. The reason being, they just seem so lucid and somewhat spiritual in the way that most "abductees" describe them. It makes perfect sense to me; in the past, demons fooled people in explicitly supernatural ways because there was no such thing as naturalism. But now, in our modern western society, we have Scholastic minds. And, I don't find the notion unlikely at all that demons could take on the appearance of "natural" aliens to deceive people with a western mindset. In the age with less God and supernatural, the demons will adapt to deceive us in naturalistic ways. As for the cases of people claiming to see UFOs in the sky, those are probably just cases of misidentification more than anything; ie, someone sees an airplane after a few beers and thinks it's an alien ship. I find it odd that when aliens capture people and talk to them (which alone is strange that they know our languages) that they almost always mention religion and Christianity in particular. The adverse affects of abductees is way to shocking to consider ALL stories to be made up. There is no other choice, as ridiculous as this may sound, I have no doubt in my mind that so-called aliens are actually demons/nephilim. It is also important to note that many of the people who have these alleged experiences with extra-terrestrials end up destroying their lives in the end. They visit all these mediums, get into all this weirdo occult stuff and spend every waking moment thinking about the aliens, wanting to contact them again, going to great lengths to "contact" them, believing that the aliens are speaking to them etc, and oftentimes in the end, they end up committing suicide. This seems demonic. As for the cases of people claiming to see UFOs in the sky, those are probably just cases of misidentification more than anything; ie, someone sees an airplane after a few beers and thinks it's an alien ship. As anathema as this is or is not, The Book of Enoch makes note of the Angels greeting Enoch on a "flying house" made of crystals. Regardless as to whether or not said book is right or inspired, it certainly is something to think about, although there definitely is a lot of misidentification involved too, I'm sure demons can also trick people in this way. How about "Big-Foot"? Tons of people--even ancient Native American lore--bear witness to the existence of hairy humanoid creatures inhabiting the forest. Yet, scientifically speaking, there is no way this could be possible because in order for bigfoot to exist, there would have to be a breeding population, and it is very difficult for such a large species of animal to remain so hidden from the majority of the world for so long. Perhaps "Bigfoot" is also demonic? It is interconnected with the human desire to discover something special about ourselves that is NOT from God; ie, in the case of Bigfoot, the possibility of learning more about our evolution and fossil record, possibly discovering something amazing? There is a fairly large cultic type following of this stuff, so he probably speaks to it because it is relevant to the times in which we live. Are you asking for people's opinions as to whether they agree with the Archbishop or something else? What do you think 'aliens' are? It's not Scholastic. Use modern, if you must use anything, as that seems to be what you are attempting to convey. It's killing me. Having only a passing acquaintance with the testimonies of alleged abductees, I will have to take Archbishop Chrysostomos' distillation of the common features of these experiences (derived, it seems, primarily from John E. Mack) at face value. Of course the article is far too brief to be regarded as anything but the musings of a concerned pastor, and I think it is understood by everyone here that there is no authoritative Orthodox position. But the abductees' experiences as he relates them, and as I have heard related elsewhere, if they possess any veracity at all, do seem to betray a marked demonic element. I frankly find this explanation more plausible than the idea of these being creatures from another galaxy/ physical dimension, etc. As the Archbishop points out, the lives of the saints are replete with instances where the demons both manifest and act physically, in order to cause both spiritual and physical harm. So that aspect of the encounters is easy enough for me to accept. Also, these experiences tend to cause people to become psychologically unhinged, more or less, which is certainly indicative of demonic activity. In short, I tend toward agreement with Archbishop Chrysostomos' thesis, with the reservation that I simply do not know enough. Since you posted it and asked us to discuss, what do you think? In my area a few years ago it has been reported the sight of an ufo space ship, near a power pole. The ufo left geometrical round forms in the lane. It all apeared at tv. Which book of Enoch, there are more than one. I read 1Enoch and I don't remmeber seing that in there. I've tended to think that the alien thing is bunch of crock and doubt that this is anything other than a cultural/psychological phenomenon - neither alien OR demonic. I could be wrong. We'll see if I ever get abducted. In my area, a couple of years ago dozens of people called the local television station because they saw hundreds of little lights flying through the air above a major roadway. Later, it turned out to be balloons with twinkling lights inside that a local church had launched that evening as part of a Christmas memorial service. I believe we give too little credit to Satan and his demons in general. Many things we reason away or find other explanations for are due to his cunningness and incessant turpitude. Like planting fossils underground to deceive us that evolution is true? At least you amuse yourself. They have alot of abilities you can find out about there snares(abilities) through readings of church fathers, saints and monks. So yes IMHO demons are masquerading as aliens. I think they are masquerading as a lot of things. No. Rather, like planting philosophy that masquerades as science in people's minds so that they actually believe that the fossil record supports evolution in spite of gaping holes in it. It's somewhere in 1Enoch. I'll have to go look for it after work. I was listening to a series of lectures on JRR Tolkien and the lecturer noted that in the past, people would tell stories of being caught up in/trasported to Faerie and then return with wild tales of their adventures. Nowadays, many people scoff at such tales but have no problem believing in alien abductions. The stories are the same, only the delivery is different. If a demon lacks a physical body, then how could they physically abduct a human? Angels generally have tremendous power over the physical world (so far as God allows it), even though they are not physical. How could the angel wrestle with Jacob? 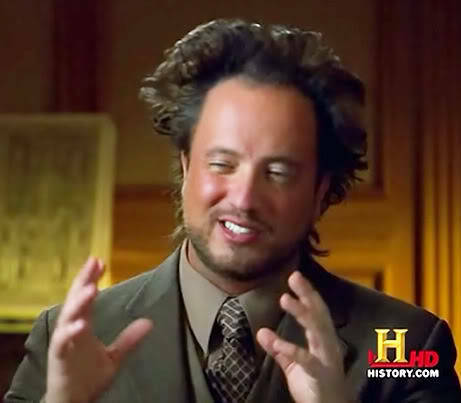 If ancient aliens didn't exist, how were the demons able to abduct Orthodox Christians? Is the Jewish tradition as definitive as the Christian tradition, regarding the bodily/spiritual nature of angels? Could angels assume human form? "There is some debate among the great Jewish philosophers whether the angels that the Torah describes as appearing actually assumed a visible physical form, or they appeared in the course of a spiritual vision or prophecy—in which the angels appeared as physical beings. According to all approaches, however, seeing an angel requires extra-sensory perception, as the bodies of the angels are not comprised of all the basic elements of a physical being." Is the Jewish tradition as definitive as the Christian tradition, regarding the bodily/spiritual nature of angels? Why would that matter? The Old Testament is part of the Christian tradition and as such is interpreted by the Christian church. There are also angels interacting with the physical world in the New Testament (e.g. in the Bethesda pool). And, of course, before his incarnation, God didn't have a body either. What about the angels who visited Abraham? Didn't they sit and eat with him? There have been incidents in the lives of the saints, where these holy people have been beaten by demonic forces with bruises and/or broken bones to prove it. It has been a while since reading such a collection, so I do not have any references at hand. However, wasn't St. Nectarios of Aegina bothered by demons for a time during his life? So yes, it is possible that so-called aliens could be demonic or at least possessed. Some literature works have used the term "shapeshifters" to describe demons as they apparently cannot continue in their assumed form indefinitely. By the way, back in 1994 or 1995 just after the horrible Northridge Earthquake that occurred in January 1994, there was an incident reported on KNBC Channel 4 news where an "Angel of Light" suddenly appeared on the passenger seat of the car to about 13 drivers headed inbound and told these drivers to turn around quickly and head North out of Los Angeles because there was to be a huge earthquake in the magnitude of 9 within a few minutes. Then, in their fear, these crazy drivers all did the unthinkable, pulled a U-turn on the freeway, and proceeded to go the wrong way. California Highway Officers (CHP) pulled all 13 drivers over and asked them why they did this. Each one gave the same story, but they did not know each other, nor had they been to any conference. Officers chalked it up to mass hysteria and the news media agreed. I happened to know one of these persons who called me and said that she might be on KNBC news as she was interviewed by them. She asked me my opinions about this. I told her that it could have been demonic as who else would cause drivers to panic and endanger the lives of so many people. Believe it or not, no one was injured on that day. No crashes. I guess the guardian angels were very busy. And most importantly, no earthquake was registered that day. The news given by the "Angel of Light" was completely false. I've decided that the safest way to avoid deception by demons is to reject every single possible spiritual experience I may ever have in my life, and assume that it is demonic before I assume it is godly. If God wants to give me an experience, then it will have to be so extraordinary that there won't be a single shred of doubt that it's from God. Ask your priest before thinking that it is from God. My husband experienced a very cold wind in our garage on a day when the temperature was in triple digits (about 110 degrees in the shade). It was a freezing pool of air that chased him around. He could only get warm by leaving the garage. However, the rest of the garage was stifling hot and humid. Our priest told him that it was demonic, and to get holy water and sprinkle it around while carrying the Cross. He did so, and the cold pool of air vanished never to revisit us. Apologies in advance for the tangent, but I know someone who is convinced he saw all the trees around him flattened as a UFO appeared in the trees near his house. The fact that he saw all this while smoking cannabis doesn't dissuade him any. Ditto for someone a friend of mine knows who saw a UFO while on an acid trip. On the topic of demons, I know many people who have had direct experience with them, particular in semi sleep states (without any mind-altering substances!). My ex partner and myself both see the same figure from time to time, it's quite frightening. Having experienced physical pain from these experiences, I am convinced that in some circumstances, a demon could cause physical harm though I've not heard of anything resembling the exorcist having taken place. I've heard a theory that alien abduction is actually a hallucination experienced in a trance state, that state being quite common especially among those who have sleep disorders. It's called sleep paralysis when a person enters this state while sleeping and basically what happens is that the mind is awake while the body is asleep. When people enter this state, they very often report sensing or even seeing malevolent beings. I suspect that entering this state (which I do often as a narcoleptic) makes one more vulnerable/perceptive to demonic attacks. Edit: I was given this advice for when I see spirits. Ask them three questions, 1) who they are, 2) who sent them, and 3) what is their purpose. I have been told that an Angel or a positive presence will answer whereas an evil one will not. Having tried this myself, I have found that spirits who used to visit me regularly made their evil intent apparent then vanished once I knew to ask them these things. I've never seen this show or a clip of it and have only seen this internet bit here and yet I can't stop laughing everytime someone uses it. I think Nick or someone explained the context to me, but it really doesn't need any. It might just be the unsignified signifier. I was given this advice for when I see spirits. Ask them three questions, 1) who they are, 2) who sent them, and 3) what is their purpose. I have been told that an Angel or a positive presence will answer whereas an evil one will not. Having tried this myself, I have found that spirits who used to visit me regularly made their evil intent apparent then vanished once I knew to ask them these things. Why not just ask them to cross themselves or allow you to sprinkle them with Holy Water? If they're good then they won't care and will do it, but if they're evil they won't be able to withstand it. You can't sprinkle holy water if you're seeing them while in a trance state as you can't move your body. This is how a lot of visions occur; in that altered state of consciousness rather than when you're awake and walking around. Asking them to make the sign of the cross may well work though. This is probably another case of sleep paralysis being mistook for something "more". Why is Phenomena being interpreted as "demonic"? Seems more like rabbit's foot superstition. I am certain that happens, though my family and I have had similar experiences when comparing them so I do believe I have had genuine contact with sinister forces. I have woken up in pain having been hit in the face more times than I can count. Could demons physically interact with people? Like fight with them, have sexual relations with them or something? I am sure that demons could fight with men. Didn't Jacob wrestle with an angel? If we beg Christ and the Theotokos for help, surely they will come to our aid. Those demons will have to get through Christ and the Theotokos first!